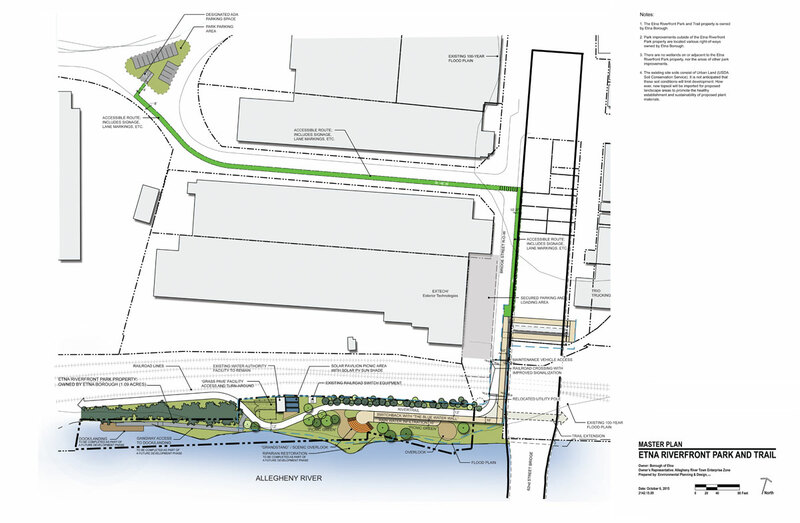 The Borough continues to work on the development of their Riverfront Park and Trail along the Allegheny River below the 62nd Street Bridge. They are currently developing plans for connections into the community and to Shaler Township so that they, too, can directly access the trail along the river in Etna and for parking areas near the trail head. They acquired the remaining parcels located in Etna along the riverfront through a donation by Friends of the Riverfront in 2014 and have diligently been fund raising to make this Park and Trail connection a reality. In 2016, the Borough adopted their Park and Trail Master Plan. Several public meetings were held for input into the design of the Park. Work for riverfront trail development both north and south of Etna is ongoing, making the possibilities for connections exciting! The Etna portion will begin at the Shaler Township boundary line and continue to the boundary with our neighbor, Sharpsburg Borough. Etna is working closely with the Pennsylvania Environmental Council, the Department of Conservation and Natural Resources, Allegheny County, Friends of the Riverfront, State Senator Randy Vulakovich and State Representative Dom Costa to make the river trail connections up the Allegheny Valley a reality.